First edition published 1982 – now being re-released on CD and eBook Down load with additional updated information. Things that every turbo car owner should know! Due to continued demand, this definitive original book is now available on CD – First published in 1982, our definitive turbo chargers manual has been updated with all the must have info to get the best out of your turbo or super charger in 2009. From the nostalgia of yesteryear to the turbo dynamics of today, I will guide you, chapter by chapter, through the development and application of turbocharging ~ including drag racing, rallying, racing, production cars and lots more besides! 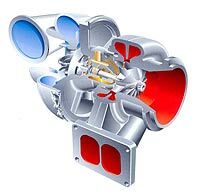 The new information covers a wide range of subjects, which include the new electronic control systems – the increased sophistication of turbo and supercharged engines – the rise and proliferation of turbo diesels – racing turbo diesels – particulate emission and filters and many other interesting aspects of turbocharging and supercharging. From the every day car enthusiast, to serious maximum power gurus, this CD will arm you with clearly explained useful facts and figures on many aspects of turbocharging and supercharging. So enjoy the journey it will take you on. It will provide an informative reference to all turbo car owners and to all those seeking some nostalgia, plus knowledge on a wide range of subject. "It is no exaggeration to say that in the automobile world there are a few subjects which conjure up so much interest as supercharging and turbocharging. Yet, dispite this, there are only a few books available on the subject, although magazine articles and technical papers are abound. I have therefore with this book set out to cover an outline of the history and development of the art of forced induction." "It was my intention to make this book of partical value and interest to as wide a range of readers as possible, I have attempted to included a large percentage of practical information, laced with sufficient technical detail to give adequate technical back-up. There are chapters covering almost all aspects of forced induction, from carburation to exhaust system designs, together with sections on diesel turbocharging, motorcycles, high performance turbocharged manufactures cars and other specialised applications." "Unlike most other books concerned with supercharging, I have written in detail about all types of supercharging, whether it be positive displacement mechanically driven or 'turbo' turbine-driven, showing the relative merits or pitfalls of each and their practical and theoretical application, together with details of design and construction of each type." Gain Knowledge that dealers don’t want you to know! Indeed, information and knowledge which could enable you to possibly diagnose your own turbo problems! Thereby saving £100’s at the specialist garages! Don’t always believe “you need a new turbo Sir!” – in many cases this is untrue – let me guide you through how to determine the truth! Find Out How To Troubleshoot Some of Your Turbo Problems! I am including some tips on analysing problems – these are included in the separate updated amendment sheets provided. From boffin heads to boy racers – to serious car enthusiasts – my CD will arm you with easily understood, exciting facts on all aspects of turbocharging. Enjoy the journey this book will take you on! It will prove an informative reference to all turbo car owners and to all those seeking nostalgia plus knowledge.